Stainless steel crowns (SSC) are metal crowns that are used to seal decay on baby molars and prevent decay from progressing. They are also used for molars that are hypomineralised (weak enamel). It is a simple procedure that DOES NOT involve any drilling or local anaesthetic and only takes a few minutes. We begin by placing spacers in between the teeth a couple of days before, this can also be done a few hours before placing the crown. This allows for space to form in between the teeth for the crown to be glued directly onto the tooth. Once crown is fitted onto the tooth your child bites down on the crown until glue is set (couple of minutes). Post SSC placement: It may feel a little uncomfortable for your child to bite down and gums may feel tight however this will go away after a couple of days. This form must be completed correctly for your child’s Stainless Steel Crown (SSC) to be fitted by Teeth on Wheels. I have read the information provided above. I give consent for the Teeth on Wheels staff members to place a stainless steel crown on the tooth indicated above. 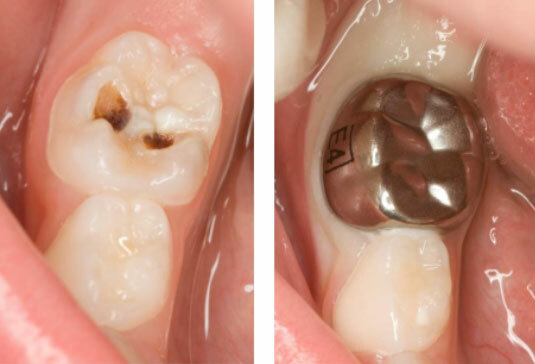 The Teeth on Wheels staff members have informed me of any complications related to a stainless steel crown and I understand why it was recommended to have this treatment completed.